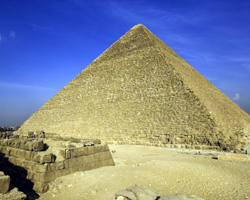 The Great Pyramids: The 1st pyramid of "Cheops". 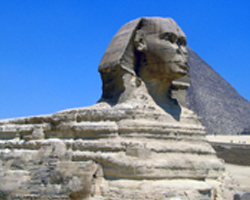 The great of ancient Egypt is structures and a pinnacle of architectural grandeur). Its fine proportions and the harmony of its lines allowed it to be taken the first place among the seven wonders of the world .This vast monument holds 2.300 limestone blocks each weighting between 2.5 and 15tons. One hundred thousand workers toiled on this structure for three months every year during the inundation for twenty years. The 2nd pyramid of "Chephren" limestone structure 135 meters high with each side 212 meters long. The 3rd pyramid of "Mycerinus or Menkaura" south west of the second pyramid. 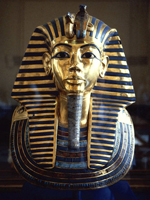 the pyramid plateau, the body carved in the form of a lion with the head of a man, to provide a symbol of power and wisdoms Especially The "Tut Ankh Amon" Treasures and the Royal Mummies room. Dating to the late 4th and early 5th Century, this basilica was named "Al-Mu'allaqah" It was called the Hanging Church because it is built over the Roman fortress on top of which has been put palm trees wood and stones to be the ground of the church. The roof of the church was made of wood in the shape of Noah's Ark. 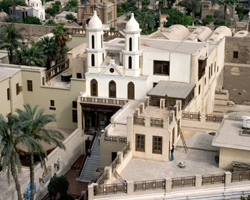 The Church of Saints Sergius and Bacchus (Abu Serga) is a 4th century church and today is considered to be the oldest of Cairo's Christian churches. It is dedicated to two early martyrs and traditionally believed to have been built on the spot where the Holy Family, Joseph, Mary and the infant Christ, rested at the end of their journey into Egypt. 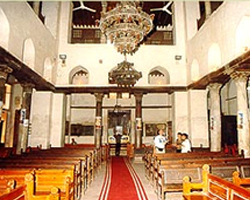 Originally the mosque was built as a place where the Arab troops could pray and was not very large. Throughout the centuries,however, the empires and dynasties that followed enlarged and modified the mosque significantly. 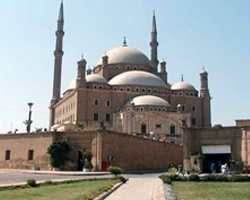 The mosque has a court-yard and minarets and is embellished with gold and silver. 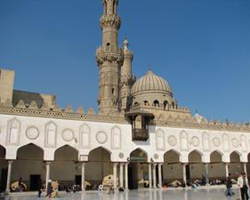 The first Fatimid mosque in Cairo, was founded in Midan Hussein by Gawhar al-Sikilli in 971 AD (361 H) as both a mosque and school( after (Fatma al-Zahraa), the daughter of the"Prophet Mohammed"(peace and blessing be upon him). It is considered to be the oldest Islamic University, the first lecture having been delivered in 975 AD. It has become the most well-known mosque in the whole Muslim World, and the oldest university ever for both religious and secular studies. 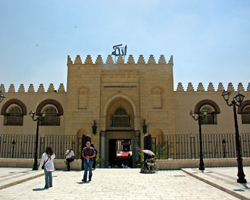 The citadel was built after the Fatimeds by the Arabic knight "Salah El Din El Ayoubi". He built this citadel to protect old Cairo which was the main city at that time from the invaders. The Citadel is located in Old Cairo on a very high hill.